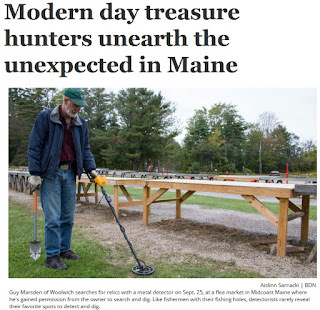 A reporter named Aislinn Sarnacki contacted me recently to see if she could interview me about Metal detecting for the Bangor Daily News. Click on the image above to see the article. She found my blog and figured I'd be a good person to talk to. I invited her to join me on a brief hunt at my favorite spot. We spent over 45 minutes and found a few interesting items as I explained the process and let her have a go swinging the detector. We found a few neat items. At the top is a steel metal punch - the signal was distinctly long and narrow and it was only a few inches down. Also the usual assortment of nails and hardware, the ring is a key ring. The best find was from a coin spill on the surface that includes a few clad pennies and an MTBA token (Massachussetts Bay Transport Authority). This is the second one I have found at this site. We also found this decorative metal bow that rang up in the 40's so I had hoped it might be silver, but it did not test as sterling. Probably plated tin. "Family Friendly Hike in Maine"